Alison Whyte is a graduate of the Victorian College of the Arts and studied classical ballet for eight years. Alison is probably best known to television audiences for her portrayal of Emma in ABC-TV’s Frontline. Alison has also appeared in The Glynn Nicholas Show, All Together Now, Blue Heelers, Bony, and Driven Crazy on television. Her theatrical credits include A Midsummer Night’s Dream and Twelfth Night, performed in Melbourne’s botanical Gardens during summer, and St James Infirmary, The Dutch Courtesan and Much Ado About Nothing for the Melbourne Theatre Company. 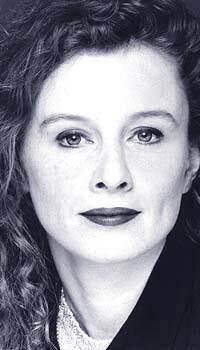 In 1996 she won a Green Room Award—The Gerda Nicholson Award for Best Actress in a drama role in Decadence. On stage she has often been cast as ’women dressed in white who faints’. "They are annoying to play because they don’t speak, someone speaks for them. I don’t see myself in that role at all," says Alison. "Stella is completely opposite to the women in white. This is what makes her such a great character." Alison Whyte is married to actor Fred Whitlock. They have recently embarked on a joint venture as licensees of the Terminus Hotel in Richmond. The hotel offers everything from bluegrass nights to bingo. A lot of sculptors and painters work behind the bar, giving the hotel a very arty feel. "Our local was sold. It had been a real community pub and that is what we are trying to re-create with the Terminus." Alison lives in Melbourne and when she is not working (at the pub and acting) she loves to potter in her house and garden. Alison Whyte continues to be in demand, with lots of projects in the pipeline. Ally will be pursuing feature film roles and following her successful run in The John Wayne Principle earlier this year, will continue to mark out her interest in the theatre. Alison says that Stella, circa second series, will continue to pack a punch and be as feisty and uncompromising as ever. Look forward to it!! Stella always has a smart answer, she shoots straight from the hip. She’s practical, strong, down to earth and street smart. She’s a feisty redhead who knows how to have a good time. Stella loves working at K for Kleen. She runs the business, she’s her own boss, and Elvis leaves her alone for the most part. She’s great at book keeping, a whiz at numbers, she knows all about figures—she’s done her father’s betting since she was nine. The customers love her, so does the bank manager—she’s neat, precise and on time; Elvis never is. Where Elvis is all for putting a sign on the door "back in ten minutes" and going out all afternoon, Stella is intent on building up the clientele. K for Kleen could not exist without Stella being around. Stella loves Elvis’ free spirit and he adores Stella’s reliability—but they’d never admit it to each other. Her relationship with Reuben is more tempestuous. They bicker, they tease and antagonise but underneath they are fiercely loyal to each other.